dejiolaluweblog: Opinion: How feasible is ending open defecation in Nigeria by the year 2025? 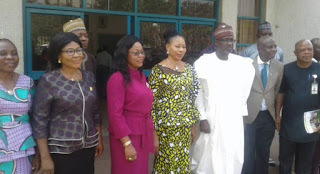 Minister of Water Resources Adamu with other dignitaries at a media workshop in Abuja..
From time immemorial, if anything is in doubt about Nigeria it’s not like coming up with compelling vision statements. But at the end of the day most if not all would’ve become paper tigers that have teeth and claws but cannot hunt down their prey. Like everything Nigeria arguably, the starting is always great but finishing poor. As such, today the country’s administrative shelves sparing no governments military or civilian are replete with great ideas on paper and even when they managed to get off it they only become white elephant projects sooner after. If it’s not water, it’s housing or health or any one of such myriads of existential necessity for all by some distant time in the future. There’s no end to protracted envisioning by the Nigerian state even if the urgency of the matter stares all in the face. The latest addition to these fanciful collections is ‘ending open defecation in Nigeria by 2025’. Sounds great, right! It all started sometime in March, 2017 or thereabout when Minister of Water Resources, Mr. Suleiman Adamu, paid a visit to Benue State and Gberndyer community in Mase town of Gwer-East Local Government Area in particular, and observed a community-led total sanitation. Adamu, who was highly impressed at the level of compliance displayed by the community, cheerfully expressed the hope that Nigeria would achieve open defecation-free (ODF) status by 2025. To achieve this, the Minister said the Federal Government has launched the Partnership for Expanded Water, Sanitation and Hygiene (PEWASH) program designed as a national collaborative instrument among government at all levels. He said this was targeted at addressing the rural component of Sustainable Development Goal (SDGs) 6.1 and 6.2 targets, which was a national roadmap of making Nigeria Open Defecation Free by 2025. Again, as recently as tail end of the year 2018 and in March, 2019 respectively, the Federal Government renewed its commitment to put an end to problem of open defecation in Nigeria by year 2025, through the Minister of Water Resources Engr. Adamu Suleiman. The minister said the ministry had to adopt the model practiced by India, (there we go again with adopting another global best practices which have in most cases prove problematic in application here) attributing the commitment to reason the state of emergency on water and sanitation was also launched. Speaking at a recently organized 2-day Water Sector Media Workshop in Abuja, the Minister emphasized that that FG launched Open Defecation Free (ODF) road map in 2016 and by 2017; only one local government was totally declared open defecation free. He identified this LGA as Obanliku out of 774 local governments in the country. He, however, described the outcome as scandalous but noted that there are several other communities that are open defecation free in the country after Obanliku was declared. He put the figure at paltry 10. His words: “Our target is to end open defecation in Nigeria by 2025 and if we are growing at this rate, that is in two years, we will be able to do ten local governments in two years and I think there’s a problem and that’s why we have decided to borrow the model of India that has succeeded in tackling open defecation. “We have only 47 million people and India has about 500 million people practicing open defecation. By November this year, we ought to have reduce it to zero within four years, India were able to bring out about 400 million people out of open defecation”. “If they can do that in four years, why can’t we reduce or eliminate those 47million people by making sure we have more rigorous campaign and that is why, in the next few weeks, you will hear a lot of activities especially on open defecation.” The Minister added. Now let’s do the sums. If only ten out of the existing 774 local governments in the country has according to the minister achieved open defecation-free (ODF) status in over three years of this administration then it means at the same rate only 30 overall would’ve attained same status by 2025. After all, 2025 is a little over six years away from now. Whereas ordinarily from the numbers given, eliminating the environmental malfeasance should be a walk in the park for Nigeria. But it's not looking like it. Despite his optimism, which is not out of place, as it’s normal for every human being or state to be optimistic about achieving laudable goals and objectives but they must be in consonance with the reality of prevalent work ethics around it. Yes, Nigeria has an estimated 47 million people spread across 774 local governments areas who practiced open defecation, yet in three years only 10 local governments of them has crossed to the other side. Compared to India, a country with dependable statistics with 500 million people practicing open defecation and yet helping 400 of them to achieve open defecation-free (ODF) status in four years is definitely a brainer. There we are definitely speaking of a country whose leadership and people understood the magnitude of what confronts them and have joined forces to stamp it out in record time. Such efforts can only be described as super human. Let’s not try to be clever than we truly are as a people. The two scenarios are not the same and can never be the same. Nigeria is Nigeria and India is India. From what we know, across the major cities and towns and villages in Nigeria people practice open defecation for the reasons of non-availability of toilets where they live, are travellers with no dedicated place to defecate, and as construction workers in a place like the FCT where almost everywhere you turn buildings are emerging out of the landscape and the surrounding bushes literally serve as toilets. That’s not all. We all have many unplanned communities springing up all around us with no toilet facilities to cater for their inhabitants. Clearly open defecation is the next available option. So to do a good job of the task at hand, the executors of this new projection must start with or by compelling landlords and landladies across the country to begin to erect or upgrade toilets facilities in their properties to foreclosed people from openly defecating anywhere and everywhere. These they sometimes indulge in at the death of the night and in some cases in broad daylight as seen in the sprawling city of Lagos. Idea of paid and compulsory public toilets should be urgently re-considered in major cities because from experience they were once part of our life but disappeared for no reasons. And where possible the government should build toilets facilities in ghettos if they’re still allowed to exist side-by-side many of our illustrious settlements. Otherwise not doing so will make a mockery of the whole plan. In spite of these suggestions and others the government must have had, the likelihood the vision statement will end up like its forebears is quite high. It’s not being pessimistic. It’s the reality of our situation where vision statements have become mere tuneful campaign slogans by successive governments either to buy time or portrayed themselves as working even when they lack the wherewithal to accomplish such. More so there’s always the lack of will power on the part of successive governments to see to their completion probably because they’re not the conceiver. One can only pray and hope this vision statement will not go the way of its equally fanciful predecessors. But chances are it would and there's little or nothing anybody can do about it unless drastic measures like never seen before are taken by government at all levels towards a vision so important to the environmental wellbeing of the nation.